For my Mad Hatter’s Tea Party I wanted to give our home a mini ‘Alice in Wonderland’ makeover. To go with my flower pom poms I also made some bunting to hang from the windows in our living room. 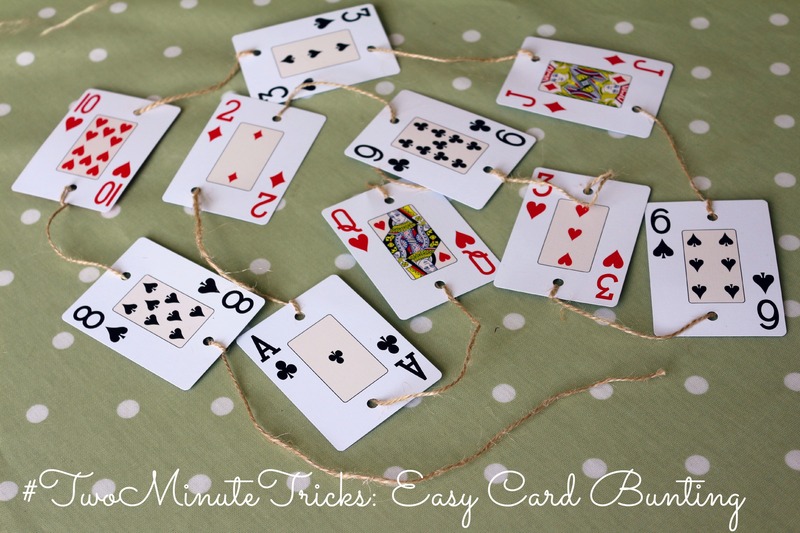 Of course, I had to give the Queen of Hearts a nod so I made my bunting using playing cards but you could apply the method of making this bunting to any card. Why not recycle some old birthday or Christmas cards? Or perhaps you have wee ones who like to paint in the house? Why not cut out some pieces of card that they can paint to make some truly unique works of art you can hang around the house. If you’re looking for inspiration, Belfast-based artist Aly Harte made this video on fruit stamping with lemons, suitable for ages 3 years and up. I’ve a bit of a crazy work week coming up so I may go a little quiet for the next few days. I’m aiming to post again on Wednesday but in the meantime I’ll leave you with this video how-to.